Our Lord Jesus Christ was crucified at Golgotha. "And when they were come unto a place called Golgotha, that is to say, a place of a skull, They gave him vinegar to drink mingled with gall: and when he had tasted thereof, he would not drink. And they crucified him, and parted his garments, casting lots: that it might be fulfilled which was spoken by the prophet, They parted my garments among them, and upon my vesture did they cast lots" (Matthew 27:33-35). 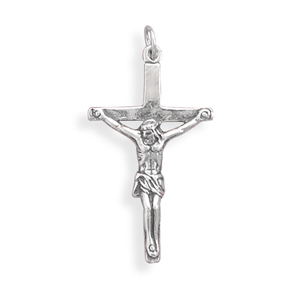 A sterling silver symbolic representation of the crucifixion of the Lord Jesus Christ, this crucifix pendant is made in .925 sterling siver and measures 31mm x 17.5mm in size (1 1/4" x just under 3/4"). We guarantee our Oxidized Crucifixion Cross Pendant of our Lord Jesus Christ to be high quality, authentic jewelry, as described above.